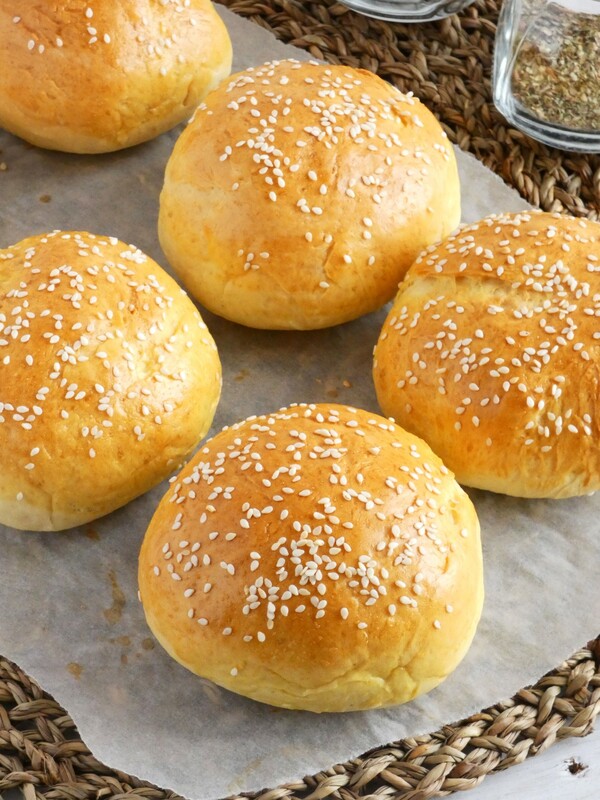 If you haven’t try to make burger buns before in your life this recipe will change that forever. 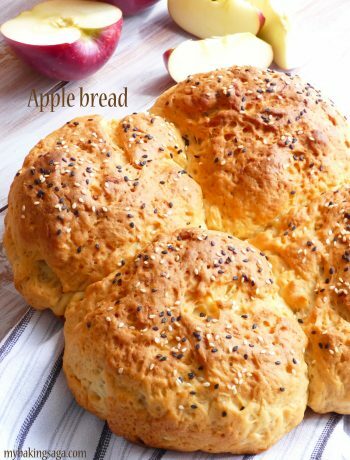 It is so easy that a child can do it and so tasty that you will forget about store-bought buns once and for all. Their texture and their flavor can’t even compare with any store-bought. They are soft and fluffy but so rich in the same time. Making homemade burgers for your family or friends without using homemade buns too is half way to the total tasting pleasure and this is such a pity! It is not necessary to make them in the same day that you want to make the burgers. I understand this is perhaps too much for a working person. Plan ahead and make them days before. 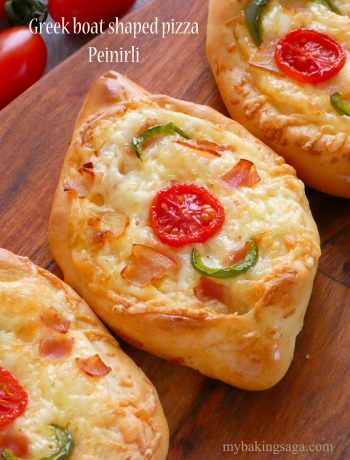 Bake them, let cool completely and put them in the freezer right away. 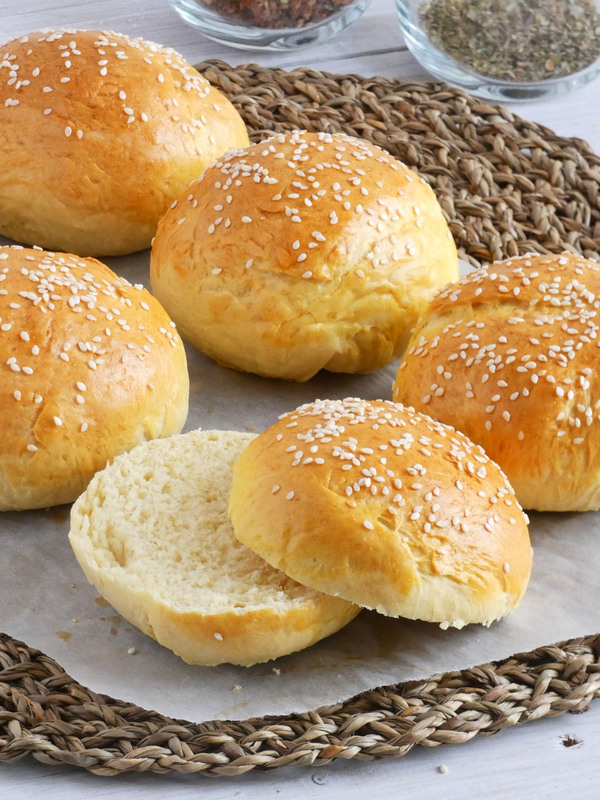 This way you will have burger buns like freshly baked whenever you want! As I mentioned before making the dough is an easy job. Knead all the ingredients in your mixer and that’s all. 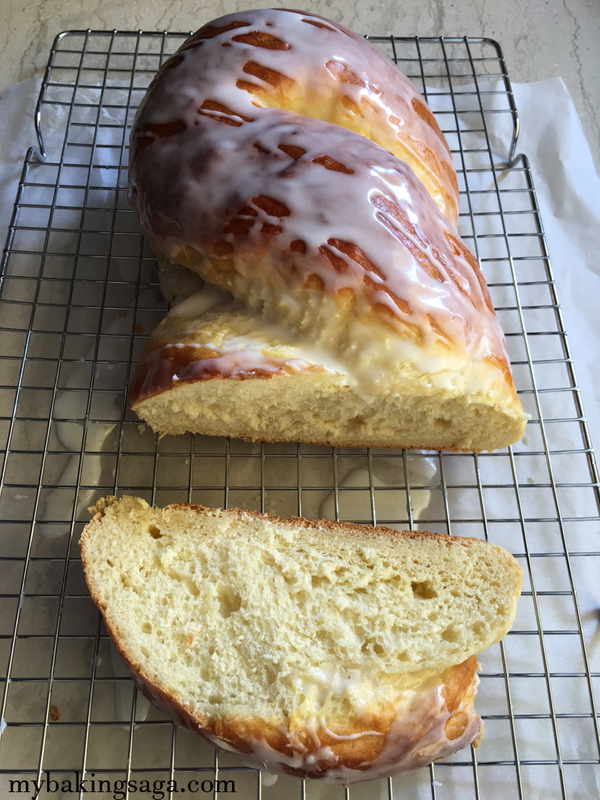 The dough should not be sticky or too watery. It is firm but soft, elastic and easy manageable at the same time. Let it rise once then shape it to buns and let rise once more. 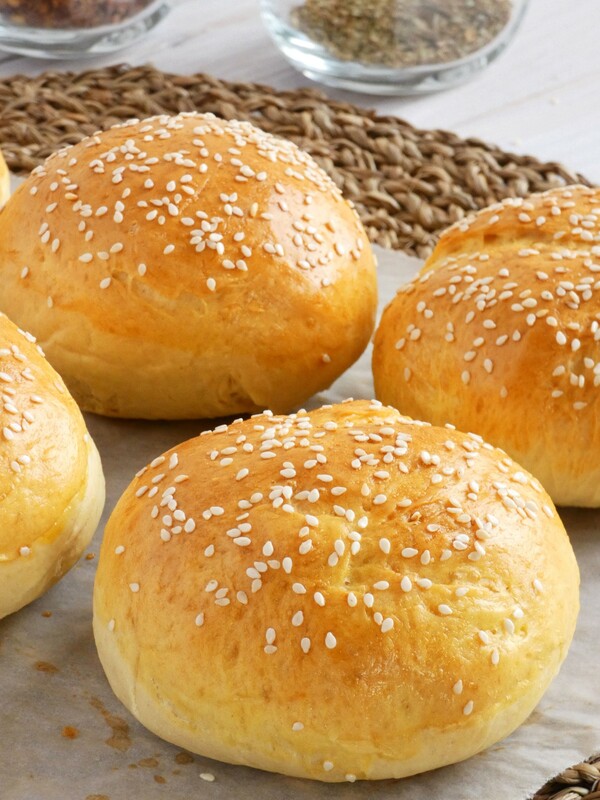 Bake and be ready to taste the most amazing burger buns ever! Not too sweet (after all it is not a dessert), not too fluffy (it should be firm enough to hold the filling in and not break apart when taking a bite), not tasteless but tasty enough to complete a perfect burger! Put all the ingredients for the dough in the bowl of a standing mixer (don't put salt and yeast in the same spot in the bowl before turning on the mixer, because yeast may be deactivated by salt). Knead with the hook attachment in slow speed until you get a nice soft dough that doesn't stick to the sides of the bowl, about 5-10 minutes. Cover the bowl with a kitchen towel and let the dough rise in a warm place until doubled in size about 30- 45 minutes. Gently deflate the dough and knead it a little with your hands to be smooth about 2 minutes. Divide the dough in 8 pieces (100 gr each) and form each piece into a ball. Put the buns on a baking sheet lined with parchment paper and slightly flatten the top of each bun. Let rise again for 45 minutes to 1 hour. 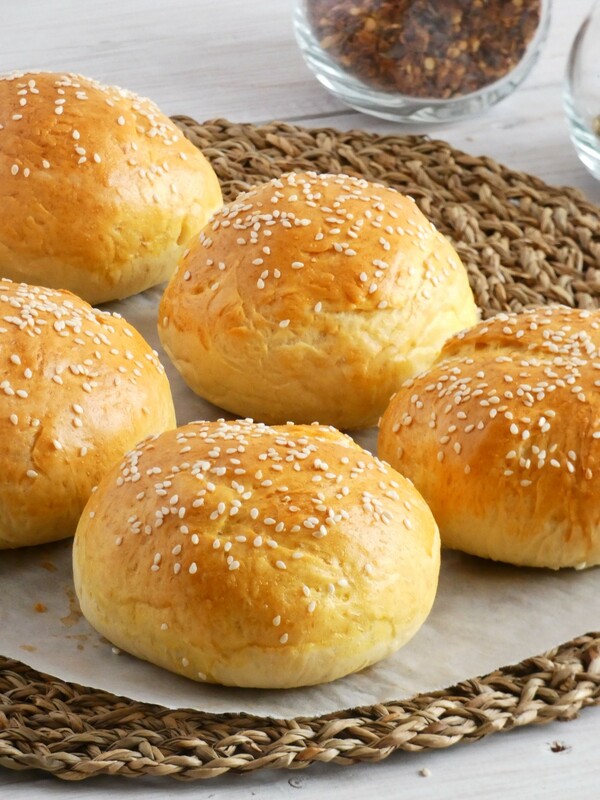 Brush the buns with egg wash and sprinkle with sesame seeds. Bake in a preheated oven at 180°C for 15 minutes. Let cool before using to make your favorite burger.